90,000 B.C. � A great Ice Age is fast approaching. Another titanic struggle for global supremacy has unwittingly commenced between the varying animal species. 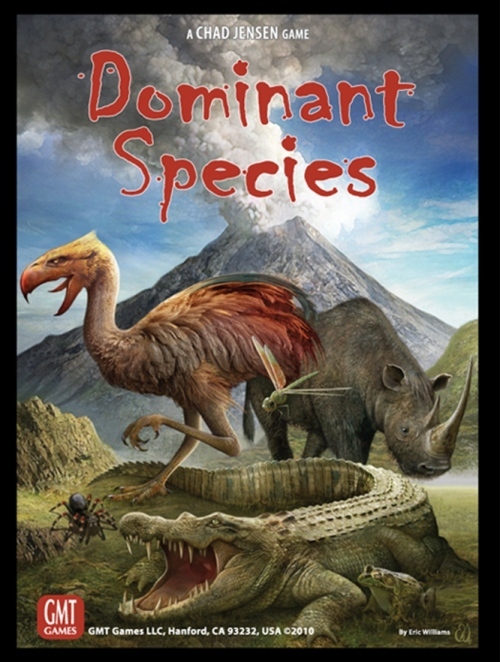 All of this eventually leads to the end game � the final ascent of the Ice Age � where the player with the most Victory Points will have his Animal crowned the Dominant Species. But somebody better become dominant quickly, because it�s getting mighty cold�. Throughout a game of Dominant Species large hexagonal tiles are placed on the board to create an ever-expanding interpretation of Earth as it might have appeared a thousand centuries ago. These tiles represent the various terrain such as desert, mountain, forest and sea. The smaller Tundra tiles will be placed atop these larger tiles � converting them into Tundra in the process � as the Ice Age encroaches. The cylindrical Action Pawns (or �AP�s) drive the game. Each AP will allow a player to perform the various actions that can be taken�actions such as growth, environmental change, migration, competition or glaciation. During each turn�s opening Planning Phase players will take turns placing their Available APs onto the Action Display, indicating a specific action that player wishes to perform that turn. During the following Execution Phase these APs will be removed in a prescribed order and their indicated action executed. Generally, players will be trying to enhance their own Animals� survivability while simultaneously trying to hinder that of their opponents��hopefully collecting valuable victory points along the way. The various cards will aid in these efforts, giving players useful one-time abilities or an opportunity for recurring victory point gains. Throughout the game Species � represented by colored wooden cubes � will be added to, moved about in, and removed from the terrain tiles in play (the �Earth�). Element markers will be added to and removed from both Animals (�need�) and Earth (�supply�). When the �Ice Age� card triggers the end of the game, players will conduct a final scoring of each tile�after which the player controlling the Animal with the highest VP total wins the game.